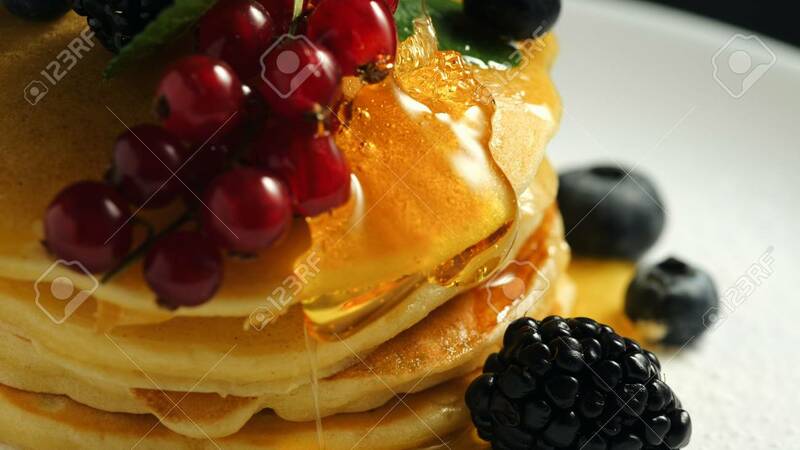 Stack Of Homemade Pancakes Or Crepes Decorated On Top With Forest Berries - Red Currant, Blackberry And Blueberry. Delicious, Healthy Classic American Breakfast. Close-up. Foto Royalty Free, Gravuras, Imagens E Banco De Fotografias. Image 114171147. Banco de Imagens - Stack of homemade pancakes or crepes decorated on top with forest berries - red currant, blackberry and blueberry. Delicious, healthy classic american breakfast. Close-up. Stack of homemade pancakes or crepes decorated on top with forest berries - red currant, blackberry and blueberry. Delicious, healthy classic american breakfast. Close-up.